By Michael Collins: Promoter Eddie Hearn says he’s seen the light after watching WBC lightweight champion Adrien Broner (26-0, 22 KO’s) obliterate his fighter Gavin Rees (37-2-1, 18 KO’s) in a methodical fashion last Saturday night. Hearn had doubts about Broner beforehand, but afterwards he realized what huge talent Broner is. Hearn doesn’t see anyone in the lightweight division that has the talent to beat Broner right now, not even WBO lightweight champion Ricky Burns. 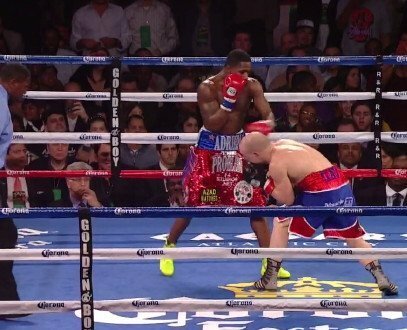 Yes, Burns would be over out of his class against Broner. The only the real difference between Burns and Rees is Burns likes to move hold a lot when facing guys that walk him down. If you watch how Burns fought Michael Katsidis, Burns was constantly holding and moving. He was able to win the fight because Katsidis didn’t have the power to hurt Burns, and Burns was also the much heavier fighter. Burns looked like a junior middleweight that night, whereas Katsidis appears to be just a tad over 135. The size difference between them was huge. Broner would weigh the same as Burns, but he would be more powerful and a lot quicker as well. Burns likes to run, and then cover up on the ropes. If he did that with Broner, he’d get knocked out in the 1st or 2n round. That’s a bad strategy, and a stupid one. Broner likes to open up on his opponents that cover up on the ropes, and they rarely escape once he catches them there. Burns might be good enough to beat Rees, but he’d be easy fight for Broner. Burns may not get past his next fight against IBF lightweight champion Miguel Vazquez on March 16th. If he can’t win that fight then it’s meaningless to discuss a fight happening between him and Broner.